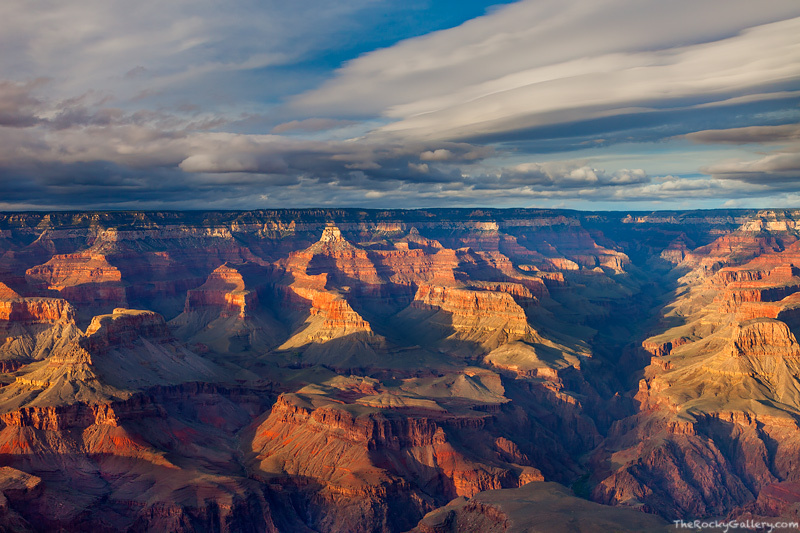 Standing on an outcrop overlooking the Grand Canyon from Yavapai Point is quite awe inspiring. This day, all the elements were coming together for me except one. A weather system was moving away from the National Park and out of Arizona leaving the Canyon bathed in golden speckled light. The only problem for me this October day was the constanst howling winds along the rim of the Canyon. The wave clouds or lenticular clouds forming over Bright Angel Canyon is testement to the high winds this day, but I was thankful as it added an extra element to my images from this shoot. Photo © copyright by Thomas Mangan.